For this week's Inspirational Challenge at ODBD, I made a very simple Christmas card. This new Adore Him die from ODBD really doesn't require much else - it's so pretty all by itself. I die-cut it twice, once out of watercolor paper and another out of black card stock for a shadow effect. I used watercolor brush pens to paint the different elements of Christmas. I then glued it all on gold card stock trimmed with the large pierced die from the Flourished Star Pattern die set. I matted it with black card stock on top of a white card base. To see all the projects created for this challenge or to join in the fun click here. You have until October 25, 2015 at 8:00pm EDT to join us. By participating in the challenge, you have a chance to win a $15 ODBD Gift Certificate good towards the purchase of stamps in the “stamps column” on the ODBD website, or to be spotlighted on the ODBD Blog at our next challenge. The random prize winner will be posted on our next challenge post. Please do not post on Flicker as many of us do not have the ability to comment on your cards nor can we spotlight your cards on the blog. Diana, I love how you made that die cut come alive with all the color!! It is so cheerful and bright and make a wonderful Christmas card my friend! The white on the kraft really stands out too! Love it! How awesome is this! Yes, the colors really bring this to life! Amazing design! Diana, this is wonderful!! Love the watercolored areas on the die- perfect for the neutral background and this week's challenge!! Hugs,my friend and God Bless! This is beautiful, Diana!! I love the pops of color your created with the watercoloring!! It really pops against your neutral background.!! Stunning my friend! Love your shadow effect here, Diana! The bits of watercolor remind me of an old fashion type of card and brings back memories of my childhood! Thanks!!! 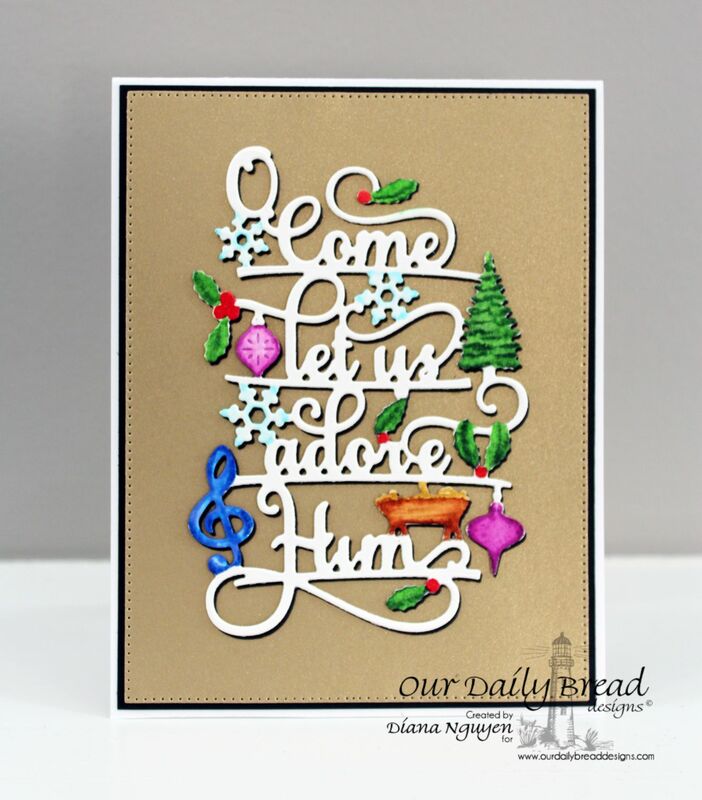 What a beautiful card, Diana, and I just love how you've colored the small elements of this die! Gorgeous and elegant! Hugs!